Foxnut is a perennial water plant growing from a short rhizome in water that can be up to 5 metres deep. 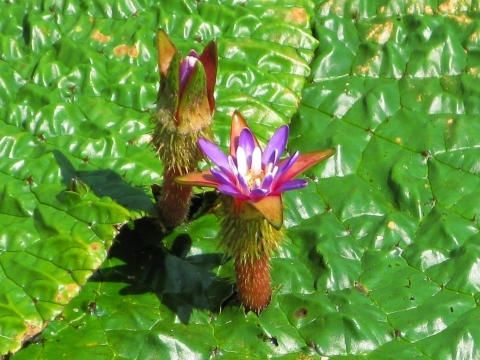 A type of water lily, it produces a rosette of large, spine-covered leaves that, when mature, float on the surface of the water. E. Asia - China, Japan, Korea, India, Bangladesh, Myanmar. A plant of the subtropics and tropics. This species is not very cold hardy. Seed - best sown as soon as it is ripe, the seed has a short viability and must not be allowed to become dry. Sow the seed in pots in a greenhouse at about 21°c and immerse the pots in water. As soon as they are large enough to handle, prick the seedlings out into individual pots and grow them on in the greenhouse for at least their first winter. Plant them out into their permanent positions in late spring or early summer, after the last expected frosts.